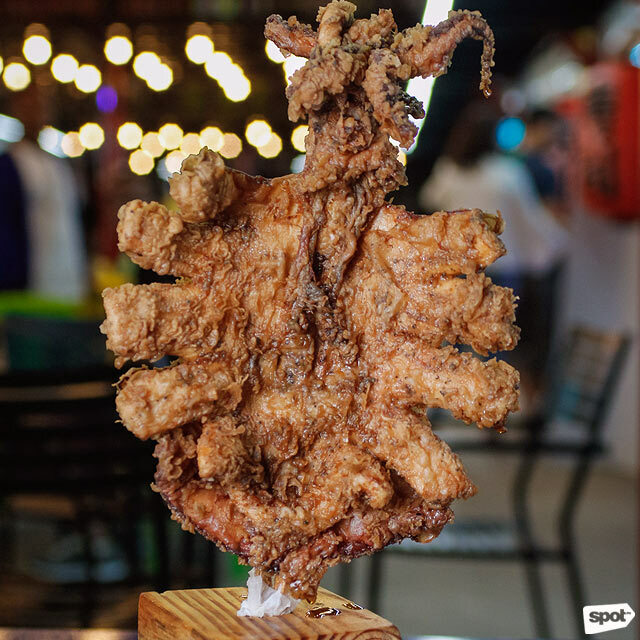 (SPOT.ph) It is unsurprising to discover that Aristotle Blas, owner of The Vibe along Mindanao Avenue in Quezon City, belongs to a family that loves food. His family would usually argue about where to head whenever they planned to eat out—a struggle that is definitely familiar. So when the opportunity to open his own food destination came, Aristotle knew that he was going to fill the place with enough variety to please even the most picky eater. 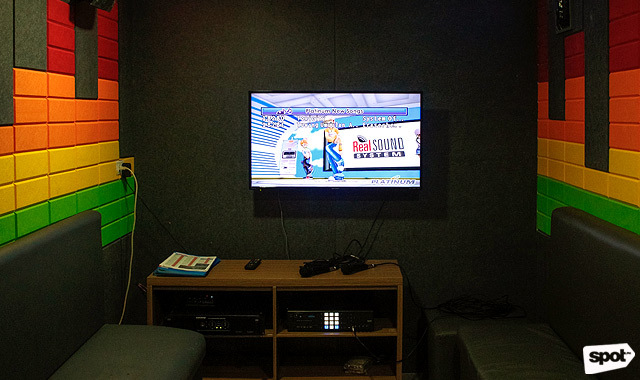 The Vibe also has a KTV room! 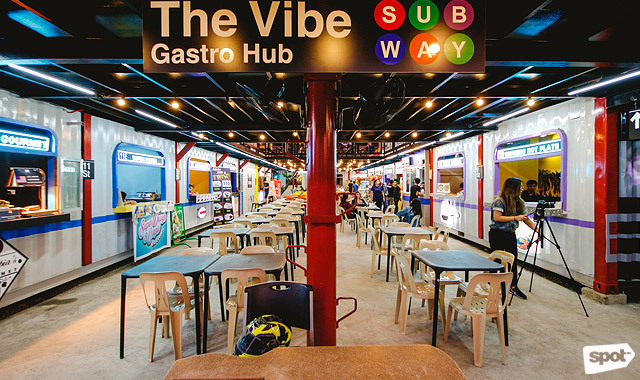 The Vibe definitely has a good mix of food stalls, with food park favorites like Japanese and Mexican cuisine standing beside less mainstream ones like Vietnamese and Malaysian. 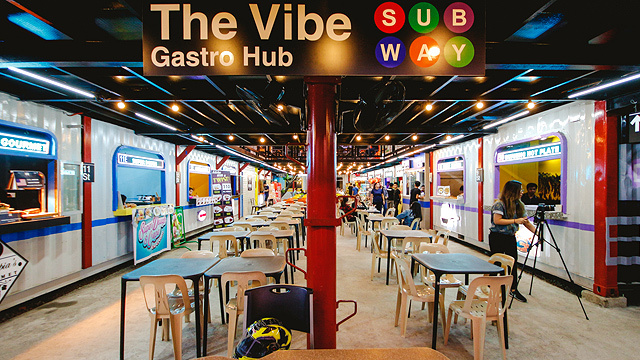 There are currently 22 food stalls housed in subway-inspired stations, or wagons, as Aristotle calls them, to choose from. The idea, he shares, is to take a trip around the world, jumping from one station to another. So hop on the ride with us as we round up the must-tries from what The Vibe has to offer. If the aquarium installed inside Baypoint’s storefront doesn’t catch your attention, the giant squids on a stick that continuously stream out of their stall definitely will. The Giant Butterfly Squid (P175) is a whole squid breaded and fried then cut open to resemble a butterfly before being mounted on a stand. The squid is tender but still has enough bite to make munching on it enjoyable, and with a familiar briny tang that shines through even with the crisp breading. Chef Gee Jay de Guzman worked in Singapore for five years, and has made Cantonese-style roasts his specialty. 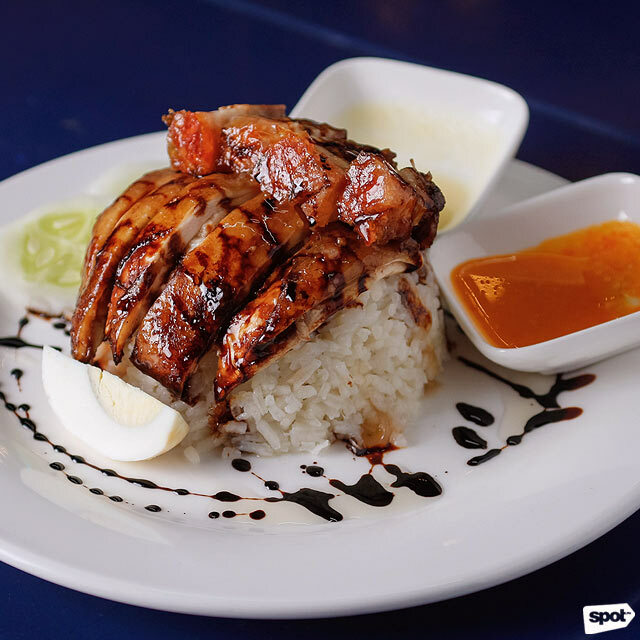 The Pork and Chicken Mix Hainanese Rice Set (P155) is the perfect platter to start you off, with a lip-smacking crispy pork belly and tender chicken complemented by a ginger sauce served on the side. Chef Gee Jay doesn’t hold back in flavoring the Hainanese rice, each bite bursting with the taste of chicken broth. Trust us when we say this is one dish that will keep you coming back. If you’re on the lookout for fresh Vietnamese food, Viet Taste is definitely a stall you should check out. Owner Luu Thuan's Gói Cuôn (P148/three pieces) or fresh spring rolls are light and refreshing, with plump shrimp and glass noodles. 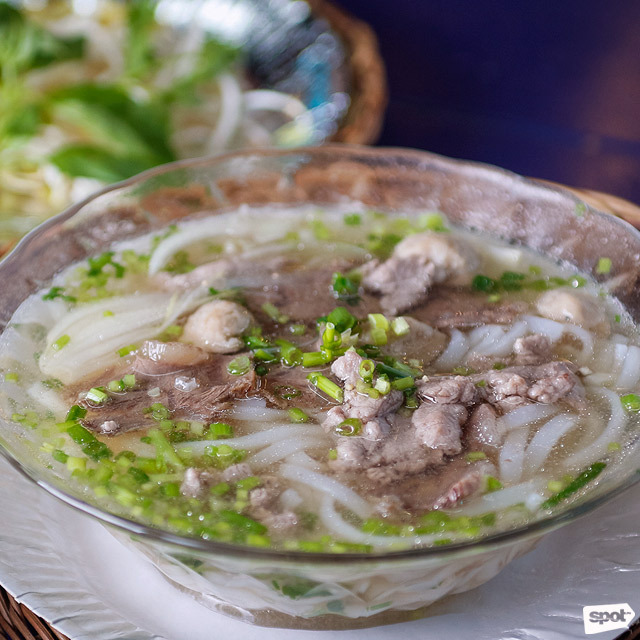 If you want something warm and filling, try the Phó Bo (P148/small, P188/large) or Vietnamese noodle soup with beef. If you’re craving Japanese favorites like maki and tempura, head over to Khanbori Bistro. A Tempura (P247) plate will get you three pieces of shrimp and three pieces of kani tempura, perfect for sharing. And their California Maki (P138) plate has 16 pieces, so there’s plenty to go around. According to owner Patrick Khan, Khanbori Bistro plans to roll out new menu items every month—this January they have Okinawa Chips! Another Asian cuisine that is underrepresented in the local food scene is Malaysian food, but Little Penang is here to change that with their bold flavors. The Char Kway Teow (P130), or flat rice noodles, is a popular Malaysian street food that's incredibly addictive—to those who are more familiar with the Thai classic pad thai, this dish is a spicier version. 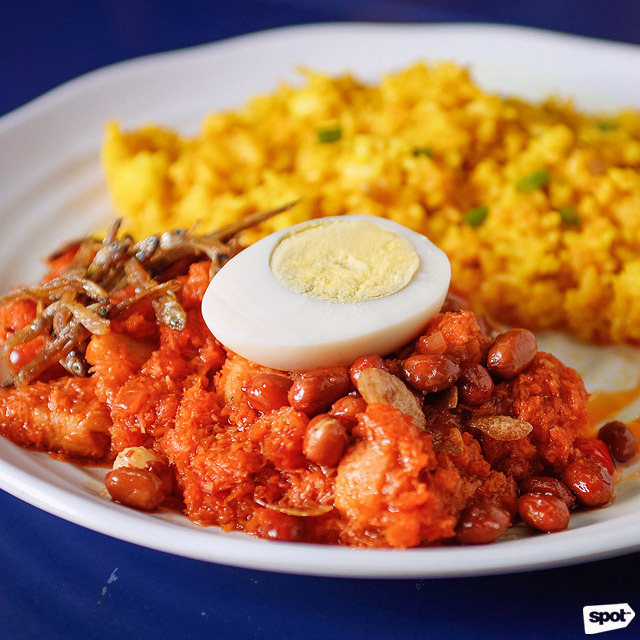 The Nasi Lemak (P150) is one of Malaysia’s most popular dishes, which Filipinos would also enjoy especially with its familiar spicy coconut milk flavor—Little Penang serves their version with turmeric rice to balance out the richness of the dish. 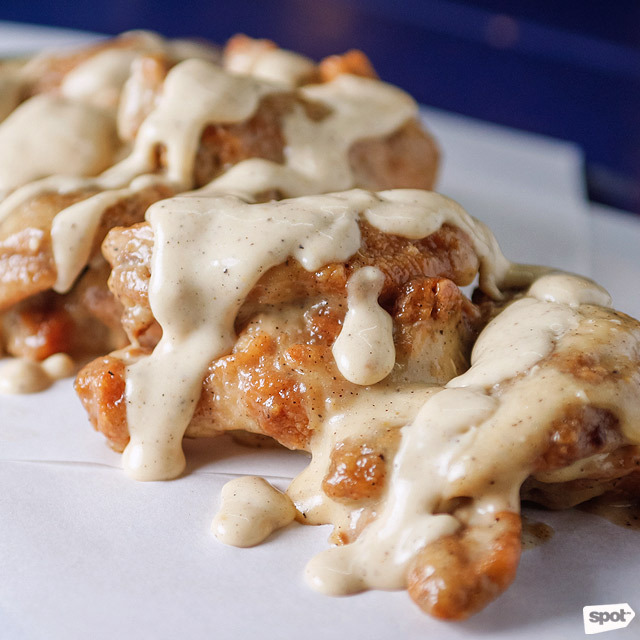 Wings are the favorite dish of owner Allan Ventura Jr.’s mom, hence he wanted to create only the best of this food park staple. The most intriguing on his menu of sauces is the Signature White Sauce (P160/one-half pound, P290/one pound), which he describes as a white barbecue sauce. The smoky flavor profile of barbecue is definitely there, with an additional creaminess that is a novel treat to the palate. 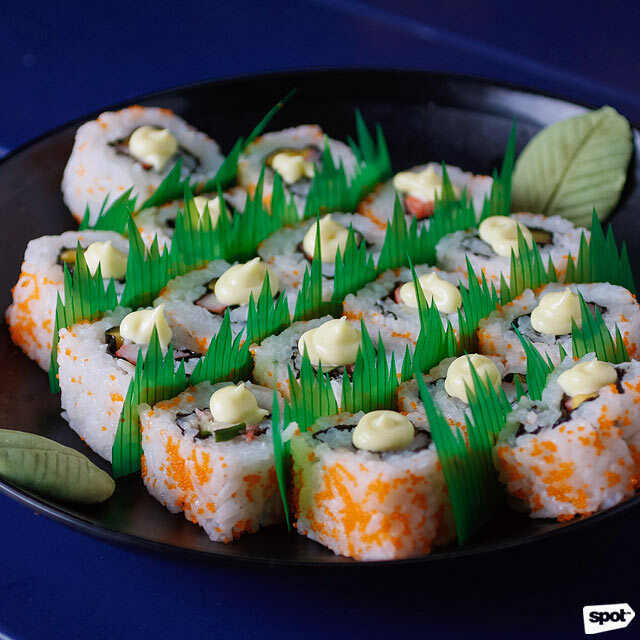 If you like your maki with a twist, then Karaaki is the stall for you. While they do have fun with their crispy toppings, they also carefully make sure that each one complements the flavors of their maki. 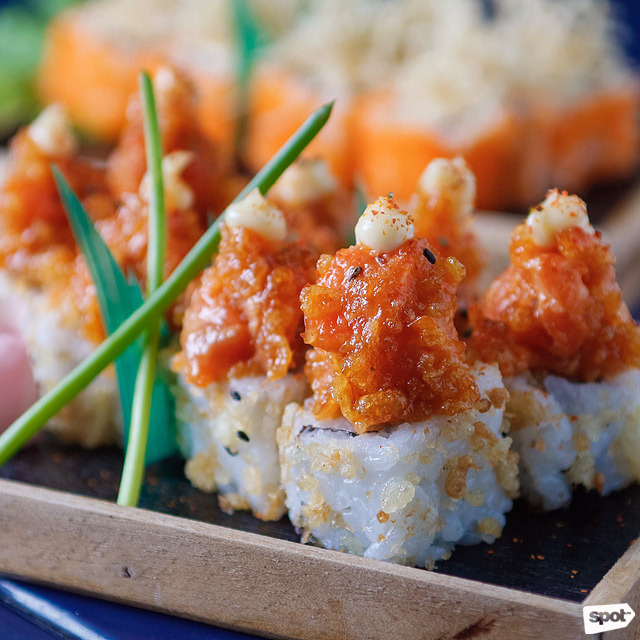 Take the Spicy Salmon Maki (P175) for example, with the freshness of the salmon still shining through and taken to the next level by the mild heat of the crunchy topping. Karaaki also serves a mean Tonkotsu Ramen (P185), with a creamy broth and tender pork. 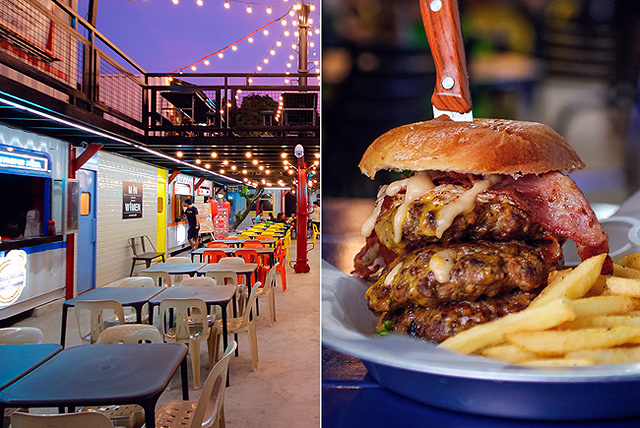 Bring your appetite when ordering from Big Mess Burger because their burgers are huge. 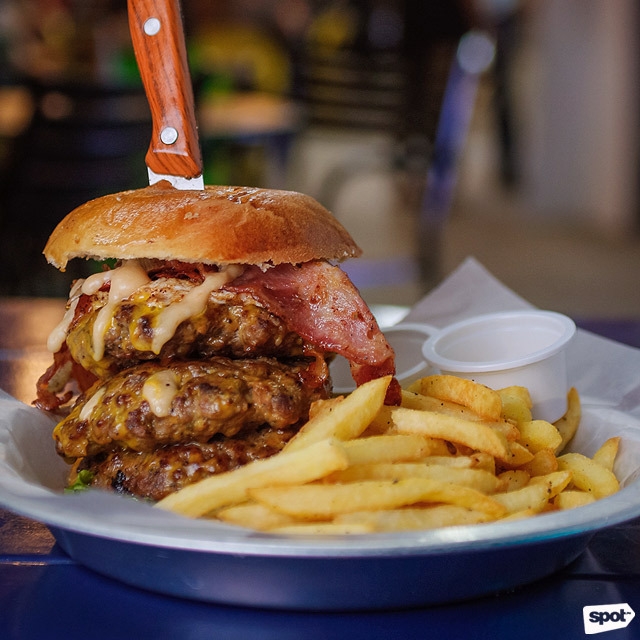 The signature Big Mess Burger (P295/with fries) is overloaded with egg, bacon, and three hefty beef patties between two soft buns. If you still have space in your tummy, pair your burger with their Chili Cheese Fries (P85). At Olympia’s, you can have your beef with almost anything and everything, but there’s no question that the star of the show is the roast beef. Made with U.S. Angus Beef, it’s tender enough for a fork to slice through and flavorful enough that sauce is unnecessary. But why miss out on their special gravy, made with red wine and beef drippings? Or try the chimichurri or mushroom gravy. From the extensive list of sides, the best-sellers are the Roast Beef with Mashed Potato (P190) and Roast Beef with Pesto Pasta (P200). 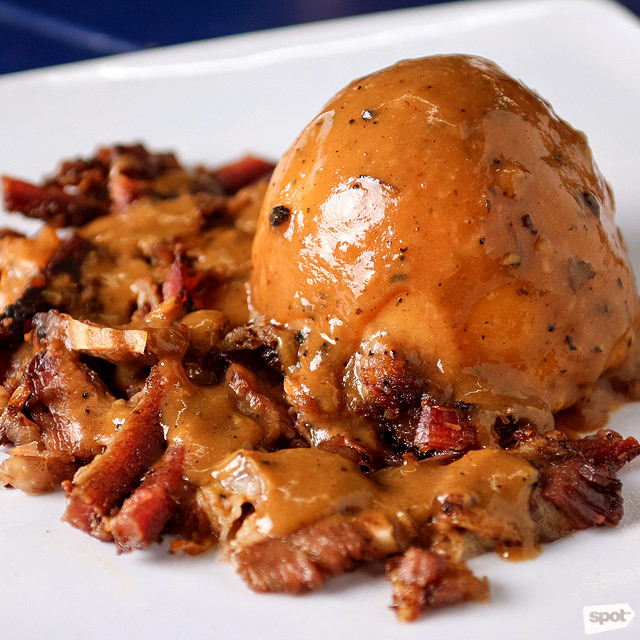 As their name implies, Burning Hot Plate specializes in anything that can be served on a sizzling plate: from liempo to Salisbury steak. 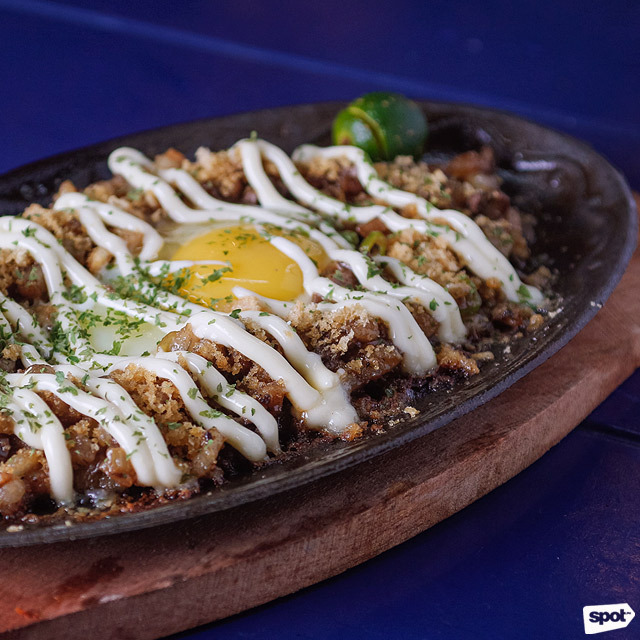 But the definite winner from their menu is the Sizzling Sisig (P179)—rich and a little on the sweet side, perfect with an ice-cold bottle of beer. Onne is named after a port in Nigeria, but with this food stall, there’s no need to travel far for African-inspired cuisine. 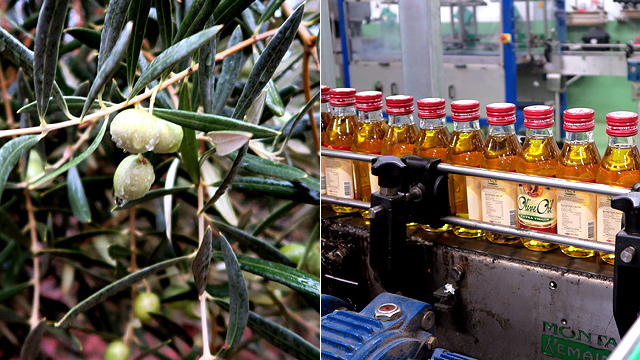 Onne specializes in African Peri-Peri, which differs from the more well-known Portuguese Peri-Peri in terms of spices, resulting in bolder flavors. A must-try is the Onne Ribs (P220/1/4 slab, P380/1/2 slab with two side dishes) smoked for over eight hours in a brick oven installed within the stall, resulting in fall-off-the-bone tenderness. 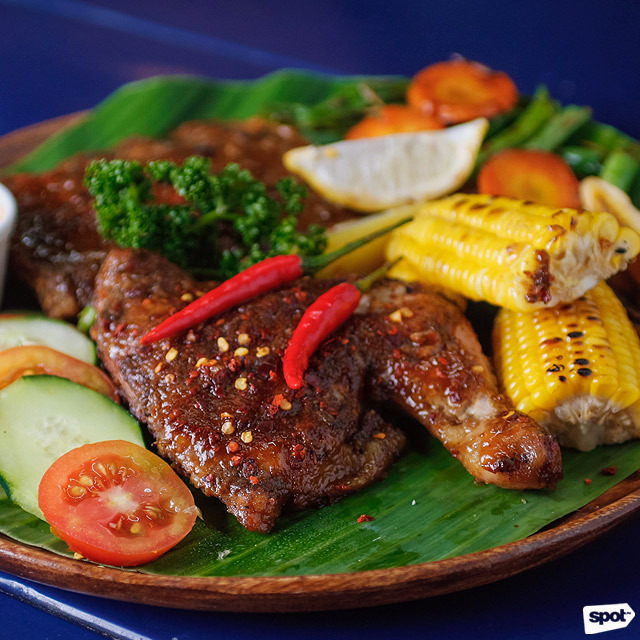 It's served with your choice among four sauces: Onne Signature BBQ Sauce, Peri Peri Sauce, Chili Garlic, and Honey Mustard. It’s all about pork here at Piggin’ Out. 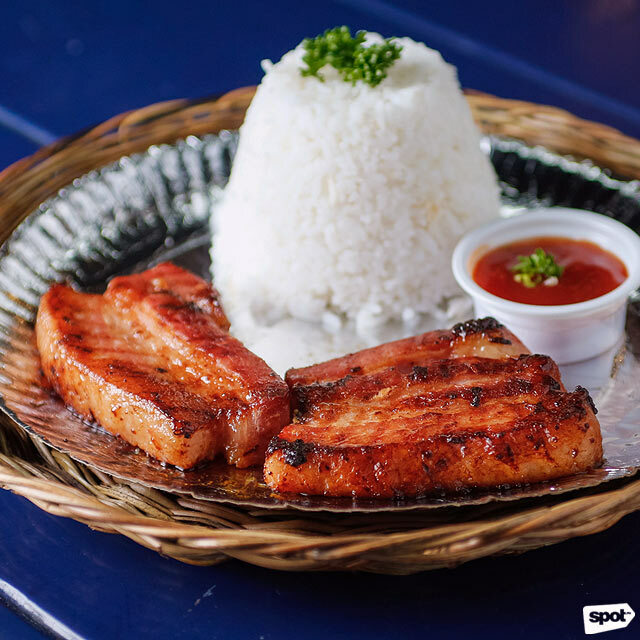 This food stall serves both bagnet and bacon dishes—and while these two may come from different parts of the globe, when it comes to fried favorites, they both share the number-one spot. Must-tries are the Slabby Bacon (P180), a thick slice of juicy bacon served with rice, and the King “B” (P180) with crispy bagnet, rice, and salted egg. With Mad Steaks, there’s no need to shell out big bucks for a good quality steak. 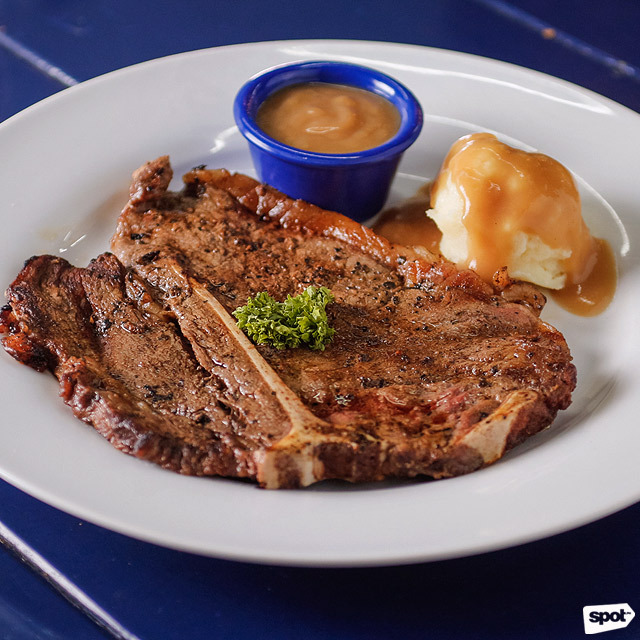 Their Porterhouse (P259) is hefty, made only with Australian beef for lip-smacking salty meat that isn’t tough on the teeth. Mad Steaks also offers pasta: their Creamy Mustard Pasta with Crispy Bacon (P159) is a must-try. 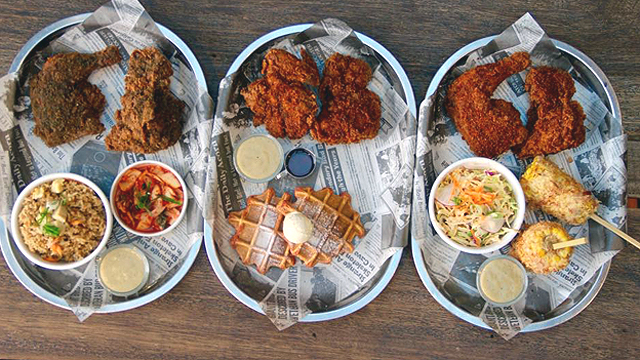 Get a taste of German street food at Berliner Grill. Their best-seller is the Doner Kebab, which may look Mediterranean but is actually a dish invented in West Berlin by a Turkish immigrant. 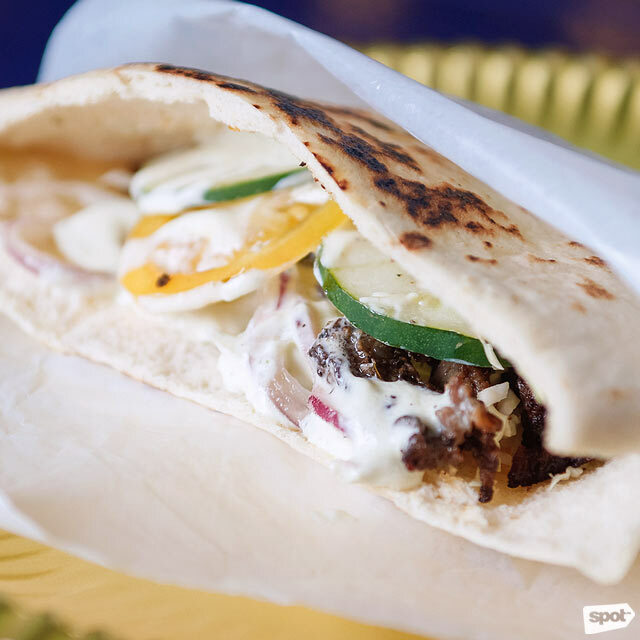 While kebab is usually served with rice, the doner is served in a lightly toasted pita bread—at Berliner Grill, they offer it with Beef (P149), Chicken (P129) or a Mix (P139) of both. Another must-try is the Pork Schnitzel (P159), served with a tasty gravy and thick-cut potato wedges or rice. Los Vatos Tacos serves bold Mexican flavors. 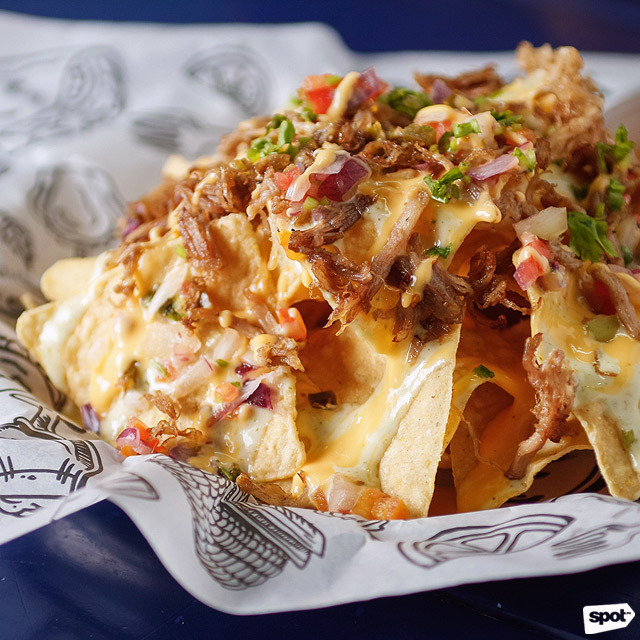 We recommend their Nacho Libre (P155), overloaded with shredded sweet-spicy pork, cheese, and pico de gallo, and the Carne Asado Quesadilla (P195), which bursts with Mexican queso in every bite. If you've been around the food parks in the Metro, you’ve probably heard of Rox Gastropub and their thin-crust pizza. 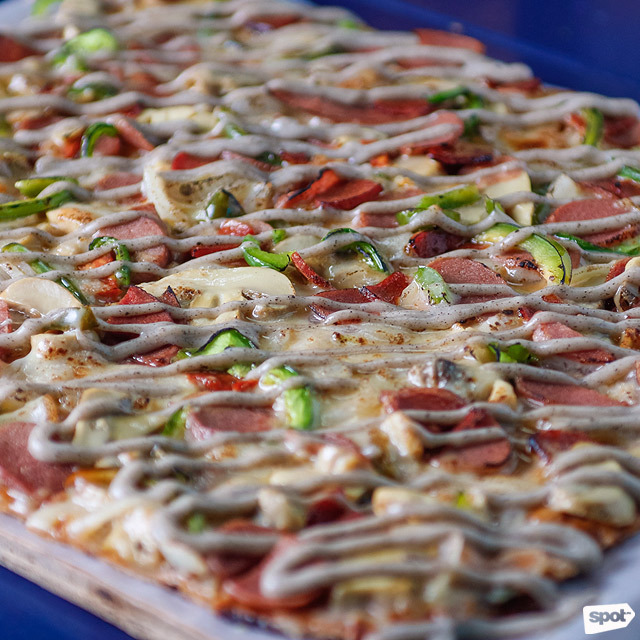 The Overloaded Pizza (P200/Just The Two of Us, P350/One Happy Family) is a definite crowd-pleaser, topped with sausage, pepperoni, mushrooms, and bell pepper then generously drizzled with a peppery cream sauce made with Rox Gastropub’s secret recipe. Kids and kids-at-heart who like their dessert with flair will love Nitroshack and their nitrogen-infused ice cream and desserts. Their ice cream base is made from scratch and customized for liquid nitrogen infusion. Plus, Nitroshack gets really creative with their flavors. 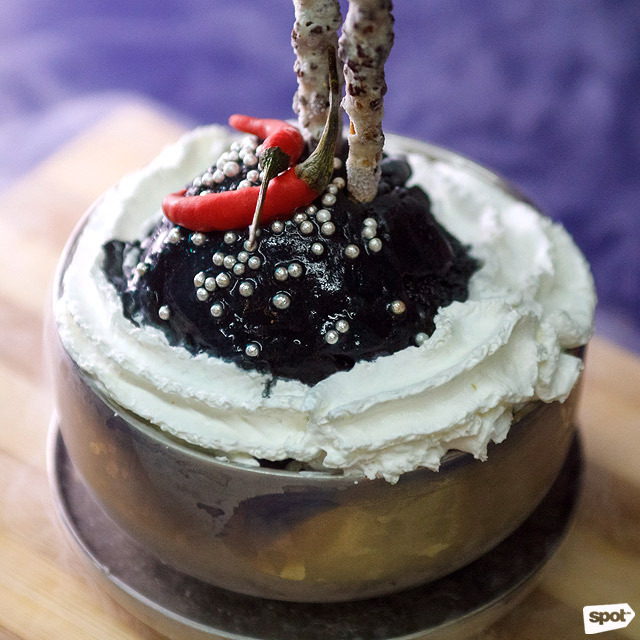 Adventurous foodies should try Devil’s Dessert (P169), which has chili blended with chocolate ice cream for a cold and sweet treat with an intense kick of spiciness. Those who’d rather stick to the classics will love the Heaven’s Treat (P160), a picture-perfect blend of vanilla ice cream, white marshmallows, white chocolate, whipped cream, and silver edible beads. 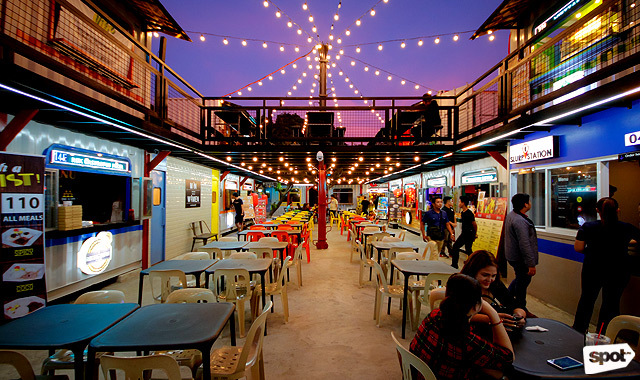 No food park is complete without crazy milkshakes, and if you’re in for something over-the-top, then Sugar Sweet definitely delivers. 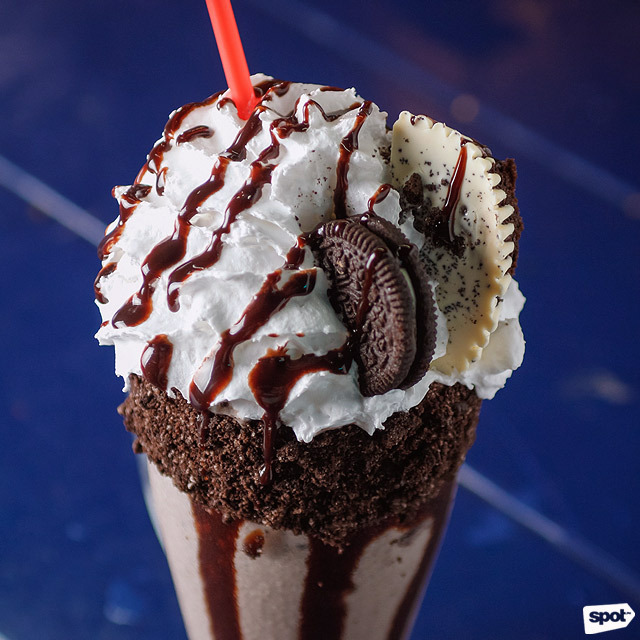 A premium Cookies 'n' Cream (P195) will get you a tall glass of milkshake made purely with cookies and cream ice cream, with a huge dollop of whipped cream, a chocolate cupcake, an Oreo cookie, and crushed Oreos lining the rim of your glass. Sugar Sweet makes sure to only use ice cream in their shake so each sip is satisfyingly smooth and sweet.